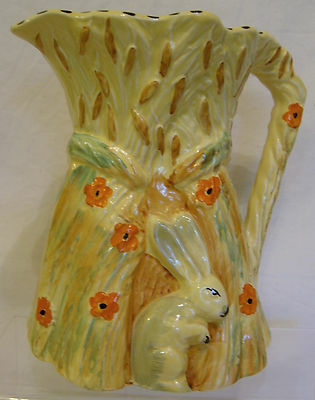 One of several (currently) delightful 7 inch (18cms) Water Jugs from Burleigh Ware, each with an embossed decoration around the Jug and each with a stylish handle featuring some form of animal. On his occasion, it is a Rabbit at Harvest Time painted in bright orange splashes overall against the yellow hues of both Rabbit and wheatsheaves. There is a spotted black rim along the top edge all set on a yellow interior ground. The Jug is in excellent condition.